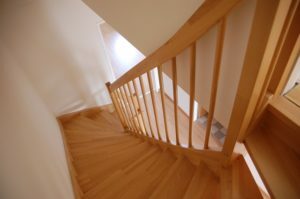 If your stairs are made of hardwood, you probably hear some squeaking as you climb up and down the staircase. As the humidity in Maryland rises and falls, you may notice that your hardwood floor has started making some strange noises. While you might assume that this is just the normal sound of the wood settling, it could be something else entirely. Here are some tips for dealing with noises that you might hear from your hardwood floor. Squeaking is one of the most common problems you’ll come across when you own a hardwood floor. If your stairs are made of hardwood, you probably hear some squeaking as you climb up and down the staircase. But what if you are just walking from one end of your dining room to the other? Squeaking is caused by changes in humidity or a hastily done installation job. You might need to use a dehumidifier or a humidifier to balance out the humidity levels in your home. Sometimes, the real cause is the subfloor. To fix this, pull up the spot where you hear the squeaking, fix the subfloor, and then replace it with a fresh plank of flooring. Popping is a delightful sound when you’re making popcorn for your next movie night in your living room, but it’s not so fun to hear it coming from your hardwood floor. The popping sound might be due to nails in the subfloor coming loose. Another possible culprit is a lack of acclimation or that your hardwood floor isn’t protected by a moisture barrier. Laminate flooring tends to produce a weird hollow noise when you walk on it. Hardwood floors occasionally have this issue too. Think about adding some underlayment to help make that hollow sound go away. Cork might be another option you can try as well, but in the end, you have to find a solution that works for you. Jason Brown Wood Floors can help, contact us today! This entry was posted on Thursday, June 7th, 2018 at 5:56 pm. Both comments and pings are currently closed.